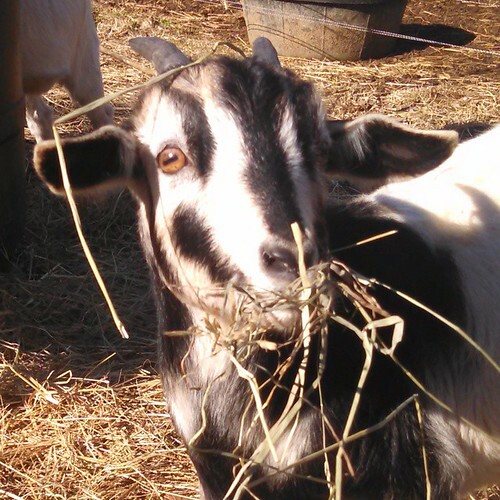 Home / Goats / Have you met Stuart Little? If you’re one of my Twitter followers, you definitely have. But I couldn’t resist giving such an adorable little guy his very own post. Just look at this face! Stuart wasn’t thriving in his previous herd, and my friend C knows I am a sucker for tiny adorable goats, so she asked if I would take him and give him a chance. Of course I did, since I already had one wee adorable wether (neutered male goat) who was born here. Stubug spent his first few weeks living in what we referred to as his bachelor pad, a separate pen within the main pen for the boys. In there he had shelter and food and no competition for either one. Soon he’d gone from a timid and depressed little guy to one who scampered in circles and yelled at us to hurry up with his hay. He’s actually never stopped yelling at us to hurry up with the hay since the day he discovered his voice. He now lives in a mini-herd with two other wethers, Frankie and Ben, plus the Very Contrary Sheep who refuses to accept any name I give her. His best friend is Frankie, who is at least twice his size but very, very gentle with his tiny buddy Stu.